I’ve mentioned before that Mom participates each morning in Freekibble.com. When the answers to the daily questions appear, they often include an article. A few days ago, the article contained such a striking photo, we wanted to share it with you. This entry was posted in Culture and tagged chimera cat, photography, striking photo, venus the chimera cat, wordless wednesday by heyitsjethere. Bookmark the permalink. We saw that kitty on the Today show. That is something, her face being two different colors. WE have a kitty here that has a split face but not as much as that kittie’s face. Hope all of you have a great day. Kind of freaky but cool! What a pretty kitty! She is awesome looking! Hey Scout, Hey Ash, Hey Teddy, Jet here. Striking I say! Mom loved the different eye colors, too. Wow! That kitty has some coloring! Just smashing! I posted a photo of a kitty today too! Great minds think alike, I guess! Hey Sampson, Hey Delilah, Jet here. HI Miss Jodi. Isn’t she pawesome! 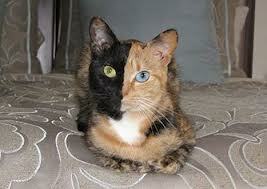 We learned what a chimera kitty was when we first read about her!! Pawesome for sure! Super cool. ow…wow!! that is really cool!!! She looks like she was photoshopped. Hey Kroten, Hey Papoe, Jet here. Hi sweet Jetty – WOW I;ve never seen that before – very amazing! she doesn’t even look real! Our Puffy has a heart-shaped marking on his head. We agree, this feline is striking! So this is fur reals, not photoshopped? I’ve seen it and wondered. Very cool looking. Supposedly she’s the real deal. Amazing! Amazing looking kitty! Gosh – almost looks painted! So nice to make your acquaintance. We agree, sort of has a touch of Picasso! Hi Jet. We saw that kitty on Facebook. She sure is very pretty. We hope you’re having a nice Wednesday. I’ve seen this kitty before, I think her pics and videos are going viral. It’s too cute and I can’t imagine seeing too many. Hey Litchi, Hey Boks, Jet here. Hi Miss Susan. Hey Bella, Jet here. Hi Miss Leslie. We do too, particularly her eyes. Freekibble is a wonderful idea and everyone can help with two little daily clicks! Wow, I’ve never seen a Kittie like that before!! Hey Benny, Hey Lily, Jet here. Yes, no photoshop, real deal!